I found a lady selling herbs and greens in the local market. She sells greens, herbs and some flowers for curing the diabetes. I even saw pirandai among other greens. The moment I saw these greens, my eyes opened widely like a child seeing bundle of chocolates :-). I came to know that she is selling them on daily basis after a small talk with her. If at all you stay near Ashok Nagar, Chennai, just get in touch with me, I will help you to get those herbal greens. Fine, today it is Adai Dosai using Balloon vine leaves (called as Mudakathan Keerai in Tamil). Knowing the health benefits of this green, enquired the ways to include it in our diet from my grandma. As per her, both the fruit and leaves can be used to prepare recipes and she suggested few traditional recipes. Grandma's are from the heaven for sure. 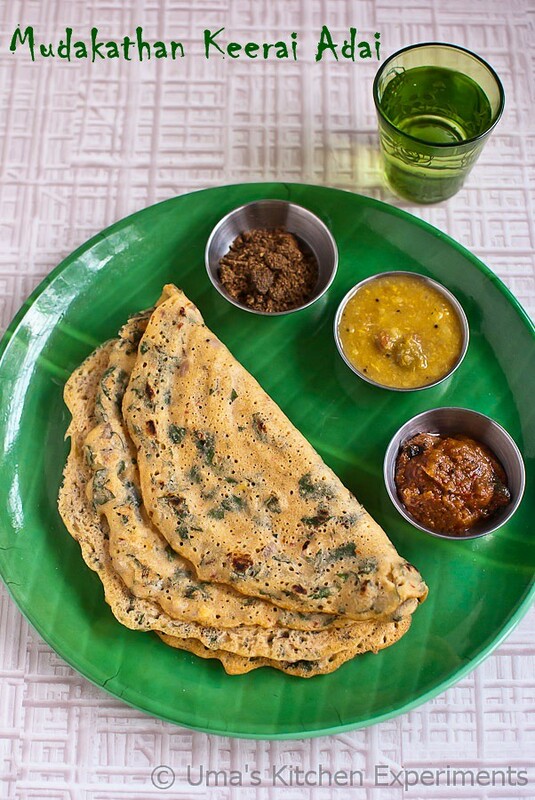 If you need a simple version of this dosa? 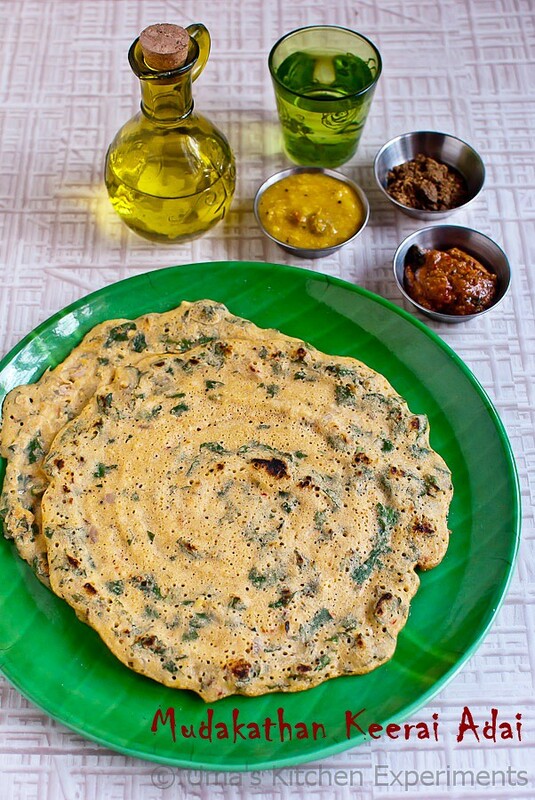 Please visit my Mudakathan Keerai Dosai recipe. 1) Soak all the ingredients given under batter for 3-4 hours or overnight. 2) First, grind raw rice, idly rice and dry red chilli together. Add little water to help grinding. 3) Secondly grind all the remaining dal together to a coarse, thick pouring batter kind of consistency. 5) Add finely chopped balloon vine leaves to the batter. Add salt to taste and asafoetida.. Mix well. Taste the salt and adjust if required, add little more water. The batter should be little thick yet be pourable. 6) In a pan, heat oil. Add mustard seeds and cumin seeds, allow it to splutter. 7) Add green chilli, onion and ginger. Saute till the onion becomes soft. 8) Transfer the entire content from the pan to the batter. 9) Finely chop the curry leaves and coriander leaves and add to the batter and mix well. Now the adai Batter is ready. 10) Heat the skillet. Spread some oil on the surface of it. When you sprinkle water on the skillet it raises a typical sound and the water disappears immediately. Its the right time to pour a ladle of adai batter. While spreading out the batter, gently spread the batter from the center towards the end of the pan in an uniform motion. 11) Drizzle oil on to the corners of the dosa. 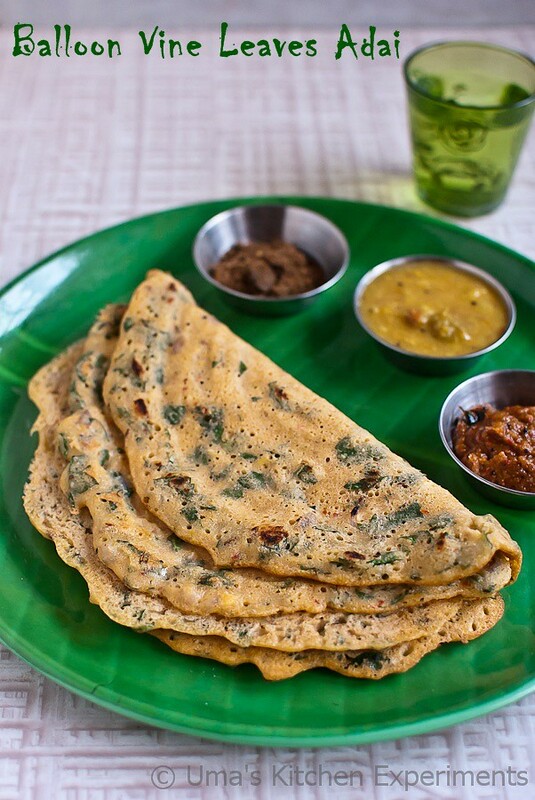 12) When one side of the dosa is cooked, turn/flip to other side and allow it to cook. 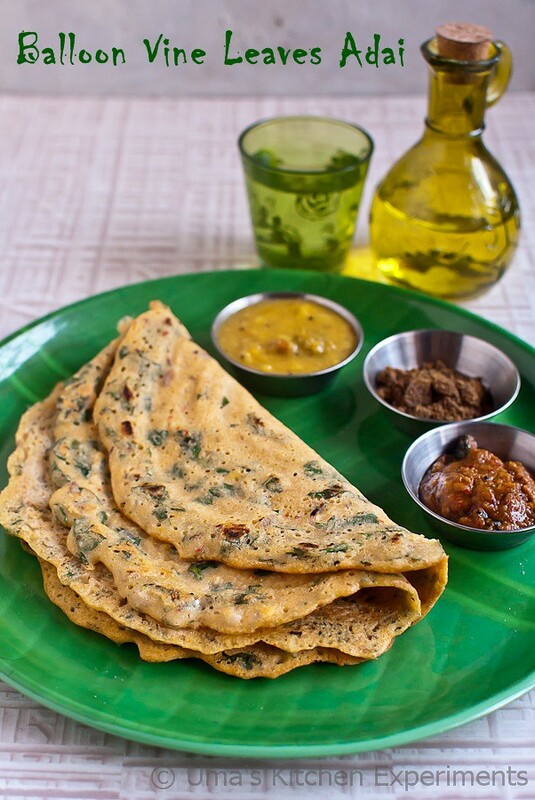 13) When both the sides are cooked, transfer the dosa to the serving plate and serve with any of your favorite chutney or jaggery. 14) We had it with sambar, ellu podi and onion chutney. 1) Pluck only the leaves from balloon vine leaves and chop it finely. 2) Increase or decrease the red chillies and green chilli quantity as per the spiciness of the one you use. 3) If you have left over batter, keep refrigerated and use it within a day. 4) Batter Consistency is your choice. Make it thick for thick Adai, thin for crisp adai. Great Blog,Such a lovely presentation,nice flicks with easy recipe,keep sharing us. Hi Uma, looks v healthy. gr8 blog. pls let me know where to get mudakathan & pirandai in ashok nagar- joint probs. my office is nearby. Hi Vinaya, You can get this green in Mettupalayam Market(Near Ashok Nagar 12th avenue).